"Live from the Coroner's Office"
The Coroner of Lake County, IL talking about life and death in the purview of a County Coroner. Yesterday I attended a meeting of the Illinois Coroner and Medical Examiner Association held in conjunction with the Illinois Association of County Officials. 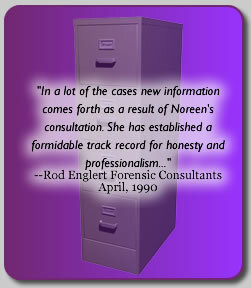 One of the speakers at the Coroners’ meeting was a Psychic Investigator by the name of Noreen Renier. It was an interesting talk and certainly not one of your run-of-the-mill topics. I guess I haven’t paid enough attention to know that such individuals/occupations exist and that they often work successfully with law enforcement, particularly, I guess, because they rarely get credit for their help (especially public credit). And this is beyond the charlatans that often get media (media used loosely) splash, she has to overcome those as roadblocks in allowing her to do what she does, apparently quite successfully. She has written a book, A Mind for Murder, about her life and some of the cases she has been involved in. I got a copy of the book yesterday, but have only read the “forward’ part. She “grew’ from doing a lounge act to helping with some very high profile cases, as well as many less well known cases including a recent case in McHenry County, IL. The Coroner from that County spoke “very positively” about her work and abilities. She works by psychometry, getting her impressions/information by touching objects connected to the crime/case or persons involved in the case. She reports “only” an 80% or so success rate (again in distinction with charlatans) and feels that use of a Psychic Investigator in crime cases should be a “last resort, when traditional methods for solving a crime have been exhausted”. She doesn’t “sell” herself or her services. After seeing her and listening to her speak, and skimming her book, I’d have to say she and what she does is the real deal. I certainly can’t explain it, but neither can she. It happens, it works. Yet another occupation in Forensics, but one it seems that applies you as opposed to your applying for it. I look forward to reading her book and do wish her continued success.